My friend Beto taught me how to not be afraid of tomatillos. (I was a little intimidated) but they are really easy to cook with. So on to the next recipe: from the ! 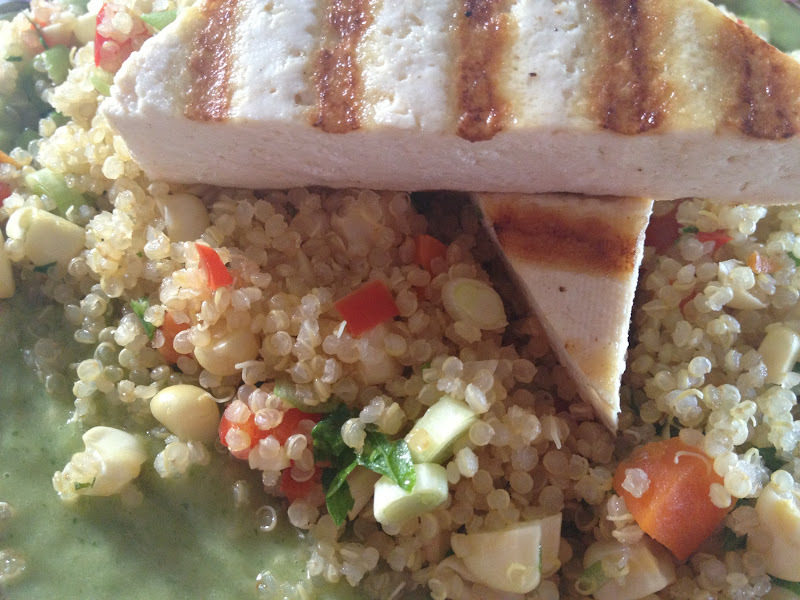 I made my lime grilled tofu and paired with quinoa vegetable pilaf and avocado-tomatillo sauce from the Candle 79 cookbook. Delicious! Press the tofu. Cut the tofu into 8 triangles. Whisk together the l juice, olive oil and salt and pepper. Heat up a grill pan. Brush one side of the tofu with the marinade and place it marinade side down on the grill. Cook until you see grill marks and then flip it over and grill the other side. Serve with quinoa pilaf and tomatillo sauce. Enjoy!